I grew up reading books by the likes of phenomenal authors such as Isaac Asimov, Ray Bradbury and Anne McCaffrey. Their works portrayed space-faring humans and unbelievable creatures having fantastic adventures in distant future and far flung regions of the universe. I fell in love with their stories, the remarkable characters and fantastic worlds their creators envisioned. These were the stories that fueled my desire to write. The GENRE LOVE Blog Series acquaints readers with aspects of the sci-fi, horror and fantasy genres that inspire, amuse, illuminate and entertain us. It’s a great way to reach out to anyone who’s ever wondered why SF authors write what we write. Guest authors/bloggers are encouraged to share their thoughts on sub-genres, tropes and news of their latest works or current projects. 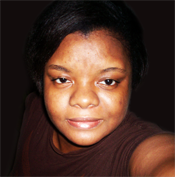 Tonya R. Moore is a Speculative Fiction writer from Manatee County, Florida. Her stories can be found in publications including Kissed By Venus, Weaponizer, Purple Magazine, eFiction Magazine and recently, Writers on the Wrong Side of the Road anthology.